Thanks for those comments, Tinted and others. Your invoice indicates SC023 is an ECU LogicImprovement. When the engine was replaced under warranty or under Kia’s Product Improvement Campaign SC023, the high pressure fuel pipe may not have been properly installed on the fuel pump outlet. A fuel leak could occur if the pipe was damaged, misaligned or improperly torqued during the recall repair. Safety Risk: Leaking fuel in the presence of an ignition source could increase the risk of a fire. Correction: The company will notify owners by mail. Owners will be instructed to take their vehicle to a dealer for an inspection. If fuel leakage is detected, the fuel pipe will be replaced with a new one. Strange that the SC023 code should apply to two different procedures. Did you have the motor in your 2015 replaced? That's a good question. Mine is a 2015 Model which I got used from a Kia dealer with about 43k kms (27k miles) just over a year ago.I never got service records with it. So there is a chance the engine could have been replaced with the original owner. This just made the evening news. Maybe it will force KIA Canada to pony up and give the Canadian owners the lifetime warranty extension also. There is now an official Cdn. recall. Strangely, when I enter my VIN in the Kia Recall Check webpage, it shows no recalls for "VIN.....". That is, it doesn't repeat the VIN I entered when it gives the response, so the site may be screwed up too. 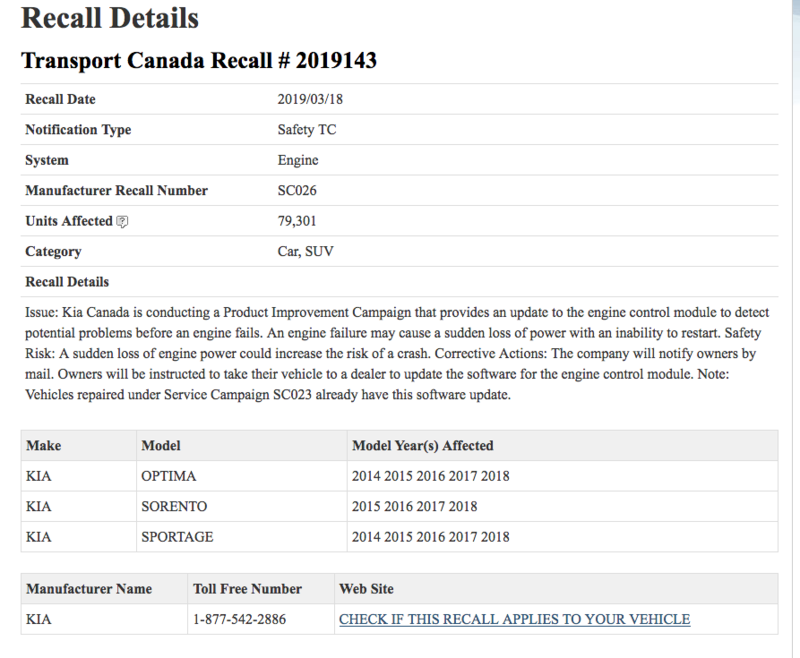 Mine too is not showing up as recalled according to the Kia.ca website. Heres hoping they offer the lifetime warranty like the US since I still plan on keeping this car for a long time. Same here, tried entering my V.I.N with no results . We'll see if KIA steps up to the plate or not. That screen shot you posted. Which website did you get it from? Mine wasn't listed either but when I went to the dealership they did the procedure. Screen shot from the Transport Canada website. There is another listing right below that one that applies to cars in which the engine has already been replaced. Just booked my service and they said no recall for my Sorento (2016 SX turbo). Maybe the dealerships VIN search is working as well as Kia's online one?? Coolwhip and Tinted like this.